Before the revelation of this verse, the Prophet Muhammad (PBUH) migrated to Medina. 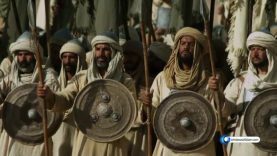 And the Jews told the prophet: “O Muhammad, we are too crowded and armored, if you do not give up your case and religion, we will kill you”. And after this promise of God, the Prophet Muhammad (PBUH) used to wander alone at early and late hours of the night in the valleys and secluded parts of Medina despite the muchness of the enemy; and those who conspired against him always failed. That is, this news of the Qur’an really turned out to be true and right; the enemies of the prophet (PBUH) could not harm him though they wished it so much.